Son, It is not proper to come to the Siddhar peetam always thinking of one's home, family and work. One should come to the siddhar peetam with spiritual service in mind. The benefits that you reap from these services can never be taken away from you, nor can it be destroyed. Son, by serving mankind, one can reach God easily. The quiet humble service of yours will fetch you prosperity, at all times, in the future. Son! service conducted with a control over our senses, service devoid of greed and jealousy, help us to acheive happiness and sucess in spiritualism. The trust was founded at Siddhar peetam in 1978, as ordained by "AMMA". His Holiness Adigalar is the founder president of the trust. The activities of the trust are guided and directed through the oracles of AMMA.The trust is undertaking educational, medical, cultural and social services with the guidance and directions of AMMA for the welfare of the society. Weekly worship centers(Mandrams) are the backbone to this movement. AMMA ordained the establishment of these mandrams and they are affiliated to the Siddhar peetam trust. Currently there are over 2500 mandrams all over the world. The main function of every worship center is to conduct a mass prayer once in a week for the upliftment of human race. Apart from this, the main activity of the worship center should be selfless service to the welfare of the society at large. Building homes for the poor. Relief to victims of natural calamities. Distributing food, clothings and books to the poor. Giving crutches and other aids to the handicapped. Providing water for lepers housing colonies. Assisting poor farmers and artisans with implements. Helping the widows and destitutes. Conducting free marriages for the poor. Performing last rites in ceremonial manner for the poor. The Charitable Trust's daily service is free medical treatment for over 400 patients and free meals for the poor. The free hospital located just behind the temple, comprises of 5 wings depicting elements of Panjhaboothams (land, water, wind, fire and cosmos) with a central dome representing the Swayambu in the sanctum sanctorum. The future plan is to expand the existing hospital with multiple specialities containing around 2,000 beds. This work is nearing completion and will function shortly. Providing free and quality medical aid to the rural poor. Organising medical camps on geriatric, eye, ENT, skin and blood donation, etc., along with veterinary camps periodically. Rendering free maternity assistance to the rural womenfolk. Giving free medicare to the poor people through well-equipped dispensary. 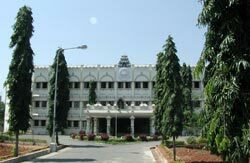 Study, Spirituality and Service are the Motto of the Adhiparasakthi educational institutions.The Adhiparasakthi group of Educational institutions have been serving the cause of education at various levels leading to professional degrees over the past 15 years. The trust supports and runs the following institution.